It is hard to predict what happens in markets and contests. But last night, I tweeted that I thought the Nobel prize for economics would be awarded for the field of practical market design. And, that is indeed what the Nobel committee announced today. I got that right and named Al Roth as one of the key people responsible for that. However, I failed to consider the lineage of that idea back to Lloyd Shapley and placed more weight on contributions to auctions. Stanford were nonetheless on to this yesterday. Nonetheless, the Nobel prize decided to focus on matching markets — that is, markets essentially without a price mechanism — and gave the award to Roth and Shapley. Interestingly, Lloyd Shapley is best known in economics for the Shapley value which is a way of thinking about who might capture value in a multi-lateral negotiation. I personally have spent a good portion of the last decade thinking about how that value could be practically applied to the theory of oligopoly. And Al Roth too had his beginnings in negotiation and bargaining theory. But it was Shapley’s work (with Gale) on an algorithm to generate stable allocations when two groups of people are to be matched with one another that turned out to lead to the greatest practical applications. The easiest way to describe this is to consider the market for marriage. Nowadays we can consider this as a market without prices (well at least not ex ante prices) but a market nonetheless as there are only a certain number of ways you can match equal numbers of men and women. As it turns out, if you imagined the market as organised — something that surely takes a ton of imagination — you might consider each side ranking the people they would like to marry of the other gender in the population. Then the algorithm would pick one side, say, women, and give them their preferences first. If several women ranked the same man as No.1, then the men’s preferences would come into play. Without going into full details, this simple procedure led to three things. First, the matching outcome was stable in that you could not find individual pairs of men and women who were not married to one another who would prefer to be so over their matched partners. Second, and related, the outcome was Pareto optimal in that there was no other stable allocation where everyone could be made better off. Finally, whichever side got to propose first (say, the women in my discussion above) got, loosely, the better deal. To put various kinds of behavior into perspective, it may help to recount the situation at an internship program we visited on selection day in 1993. This program had 5 positions, and received 200 inquiries which turned into 71 completed applications. Invitations were issued to 30 candidates to come for interviews, and 29 accepted. On the morning of selection day, the two program co-directors, who would make the calls, came equipped with a rank ordered list of 20 acceptable candidates from among those interviewed. The rank ordering was obtained from polling the psychologists on the staff, and it was understood that the co- directors had discretion about how to use it 7. Prior to selection day, about half a dozen of the candidates had indicated that the program in question was their first choice, and that they would accept an offer immediately if one were made 8. On selection day the codirectors said their general strategy was “don’t tie up offers with people who will hold them all day.” They therefore decided to make their first offers (for their 5 positions) to numbers 1, 2, 3, 5, and 12 on their rank order list, with the rationale being that numbers 3, 5, and 12 had indicated that they would accept immediately, and that 1 and 2 were so attractive as to be worth taking chances on 9. Two phones were used to make these calls, starting precisely at 9:00 am CST. Candidates 3, 5, and 12 accepted immediately, as promised. Candidate 1 was reached at 9:05 (on the fourth attempt, after three busy signals) and held the offer, until 9:13 when he called back to reject it. During this period, an incoming call (on a third phone whose number had been given to candidates) was received from the candidate ranked 8th, who now said that the program was her first choice. She was thanked and told she was still under consideration, and when candidate 1 called to reject the offer he was holding, the codirectors decided to make the next offer to candidate 8 (and not to number 4, as initially planned 10.). The offer to number 8 was then made and accepted immediately, and while that phone call was in progress, an incoming call from candidate 2 informed them that she had accepted another position. The decision was then made to offer the remaining position next to the highest ranked remaining candidate who had indicated he would accept immediately, number 10, and this offer was accepted at 9:21. After the briefest of celebrations, the codirectors called the remaining candidates to inform them that all positions were filled. These calls were completed by 9:35, 35 minutes after the opening of the market. The five positions were filled with the candidates initially ranked 3, 5, 8, 10, and 12. Three things to note about this episode, which does not seem to be atypical, are the directors’ concern not to make offers which ran the risk of being rejected late in the day, the consequent attention they paid to candidates who had indicated they would immediately accept an offer from the program, and the willingness of candidates to convey such information. Note also that the time required to process offers is very short. In what follows, we will analyze some computer simulations of the market, which show that even this short time has large consequences. But first we present some formal analysis which will provide a framework for comparison of these centralized and decentralized market institutions. This was enough practicality to convince me that market design was something that could be taught to MBAs and I used it as the springboard for a course I taught some years back. Matching algorithms have now been applied to school choice and other areas. However, there is perhaps nothing more significant than Al Roth’s work on kidney exchanges. We know that kidney transplants save lives but economists have long lamented that society doesn’t want to use prices to mediate that market. As documented in this long profile in the Boston Globe, instead of lamenting, Al Roth took the inability to use prices as a constraint (basically, he knew that society found such things as repugnant and so would have to work around it). He asked if kidney exchanges could work without prices? And the answer was yes. What you had to recognise was that you had a set of willing donors and a set of recipients. The issue was that it took luck for a willing donor to be in the same family as a recipient. But what did not take luck was the notion that a willing donor may match one recipient while the family member of that recipient may match the donor’s loved one. You just had to bring those people together. Basically, add some search and some safety (you don’t want people opting out once their own family member has received a kidney) and you are off the races. Put simply, Roth’s kidney exchange is up and running. Here is an economic theorist who hasn’t just made things more efficient. He has actually saved lives. It is unclear whether it is the economics Nobel he deserved or the Nobel prize for medicine. 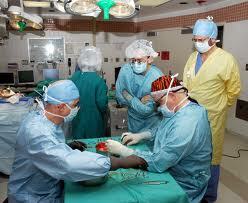 (In the picture, Al Roth is there supervising a kidney transplant in the yellow coat). But Roth has taken the notion of practical market design to much higher levels. He has looked above the field and set down a set of principles for market designers. Here is the Hahn lecture. Here is the easy to read HBR article. Basically, market design works when you can find rules that encourage thickness (lots of buyers and sellers), avoid congestion (such as the psychologist situation described above) and are safe (that people think transactions will actually take place on the terms agreed). Put those things together and you are a good way to having yourself a well-functioning market. Add to that a respect for repugnance (see here for an accessible discussion of that) and you can practically get these things done. These notions have been very influential in my own work. With Scott Stern, straight from Roth, we considered how his ideas could be applied to consider markets (or the lack of markets) for ideas, information and innovations. It was through that work that I got to know Al and he was one of the people who helped me come to Harvard for a visit in 2010. But these ideas have also impacted on my MBA students. In our class on digital strategy we do not consider platforms as a topic. Instead, it is all about market design — that is, platforms who want to bring together groups to engage in social activity are in the business of market design. And Roth’s principles are critical to understanding how to take to that challenge. Roth, himself, was at Harvard Business School for many years until he recently moved to Stanford. He was one of the very first academic economists to take the web seriously as a means of disseminating research. Al Roth’s Game Theory, Experimental Economics and Market Design page has been around since 1996 or so and is still in the same format; a long single web page with a wealth of information. It was pretty useful for finding things today, I can tell you that. And Roth also has a blog that he writes on regularly on market design issues although apparently today, for some reason, he might not be blogging. And would be book publishers, I know that Al has a great outline and sample chapters of a terrific popular book explaining his work. There is still time to “jump the gun” on that match! Josh — great synthesis. Even after having co-taught Market Design with Al the past 7 years, I found this to be an informative (and well-referenced!) read. Agree with Peter Coles. As someone who knows a bit of game theory but isn’t an expert, this gave me what I needed to understand their contributions. Thank you. I do find it strange that there have been so many game theory nobels. I can’t think of another relatively narrow area of study that has yielded so many, in any discipline. The number of Nobel contributions per chapter in, say, Myerson’s text is remarkable. Thanks for the write up. We’re using market design to match Businesses with Creative Agencies at Agency Spotter (http://agencyspotter.com) and this research is great. Previous PostPrevious Where is the social Internet?